All equipment listed is based on availability, list may not be up to date. 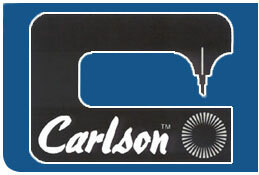 Please contact Carlson Tool Sales department for any equipment request used that may not be seen here. Available equipment owned by other person's or companies may not be listed unless at our facility on consignment. Any and all prices listed are AS IS not including parts or repairs, set up tooling or freight cost. All prices are in US dollars and F.O.B. Elgin, Illinois, USA. Filament Hank Cutter. ( s/n 645 ) 115 volt and pneumatic control with 2" bundle shoe size. In use now at carlson tool. We use this in our shop all the time. Asking $3500.00 or best offer. Dual Magazine, includes rocking table, no holders with machine.